Staff management software, designed for hospitality. Run your business from anywhere – anytime! Our mobile Apps let you and your staff access the roster and can show you who's working, who was late or who did not show up. Manage your workforce using our innovative workforce management software application. Our time and attendance software solution is based on cloud computing technology; meaning that you can access your roster, timesheet and HR tools from anywhere via tablet, mobile or a web browser. Our time & attendance app offers practical tools designed specifically for retail and fashion stores. Capture clock in/out times; see who was late, who finished early and who didn't show up. 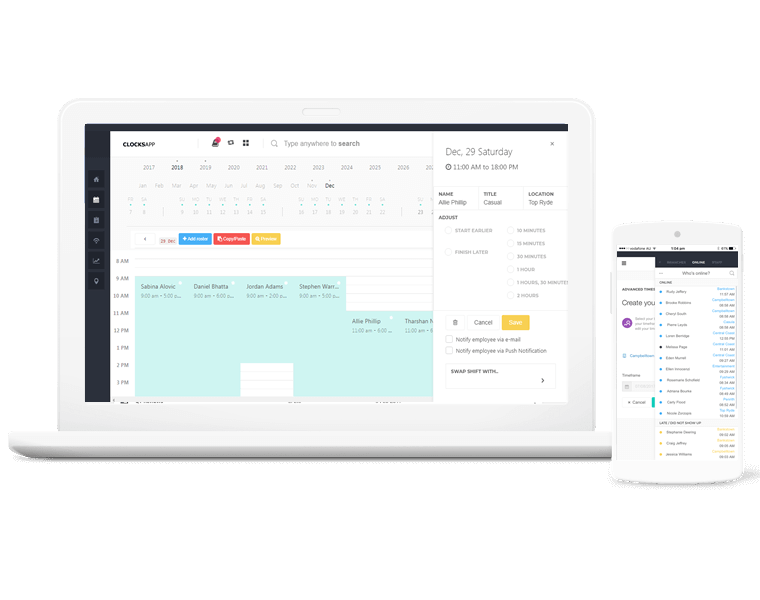 Save time scheduling employees for your busy hospitality business; our cool app makes it easy to find a replacement employee if someone calls in sick at the last minute. Our HR workforce management software was designed for offices with full-time and roster staff such as: real estate offices, playgrounds, child care centres, tobacconists and many more. Create your weekly roster in minutes using our copy / paste button. Never go over budget with our accurate roster cost calculation. Publish to employees' smartphones or simply via e-mail. Easily extract employee clock-in times from all your branches for any timeframe, manually add or adjust times and export timesheets to Xero, Excel or your favorite accounting system. Yes. Only you can access your data stored securely in one of our cloud servers. You may also request that we periodically delete your data automatically every 3 months. Yes. 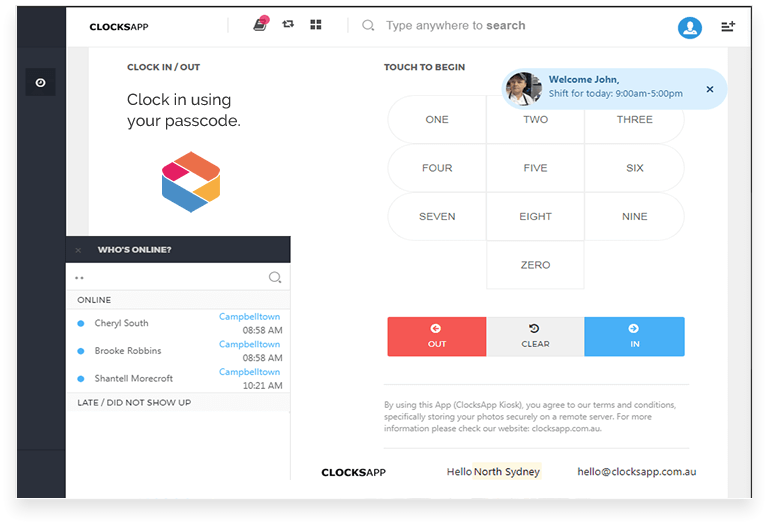 For businesses with 5 staff or less, time & attendance is completely free in all of its features. However, for medium to large businesses, it's $29 p/month p/branch. First, you will need to create an account which will give you the passcode needed to login to your HR Tools where you can add your staff and rosters etc.